Danwatch is an independent Danish prize winning investigative media and research centre, specialized in investigative journalism on global issues. We investigate states’, companies’ and investors’ impacts on human rights and theenvironment, and hold power to account in the public interest. 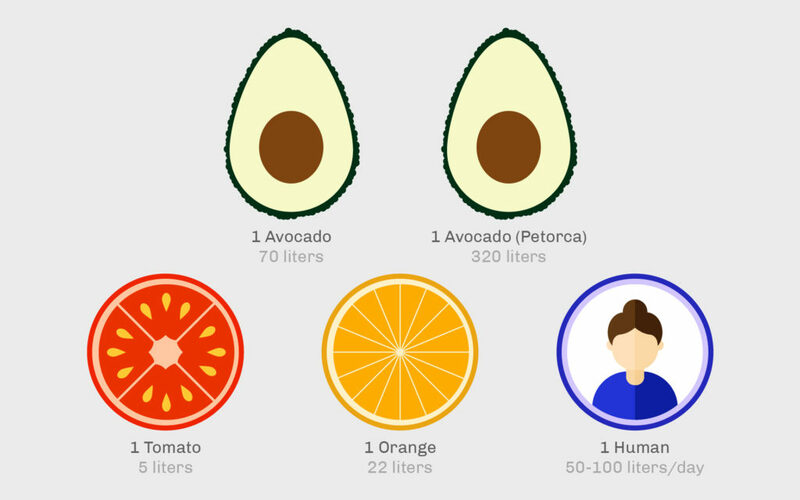 How much water does it take to grow an avocado? Avocado production requires a lot of water to begin with, but in the dry regions of Chile, where most avocados for export are produced, avocado farming is especially water-intensive. In these regions, 320 litres of water are required to grow one avocado. On average, about 283 litres of applied water are required to produce a kilogram of avocados. This is fresh ground or surface water that is applied via irrigation or other methods in order to produce a crop of the fruit, and does not include rainfall or natural moisture in the soil. This means that approximately 70 litres of applied fresh ground or surface water are required to grow one avocado. Of course, the amount of applied water needed to grow one avocado is dependent on where in the world it is grown. In the part of Chile from which we typically import avocados (Region 5, which includes Petorca Province) and where over 60% of Chile’s avocados are grown, an average of 1,280 litres of applied fresh water are needed to produce one kilogram of avocados, which means that about 320 litres of applied water are needed grow one avocado. For comparison, a global average of 110 litres of applied fresh water are needed to produce a kilogram of oranges, so each orange requires about 22 litres of applied water. To produce a kilogram of tomatoes requires 63 kilograms of applied fresh water, meaning that 5 litres of applied water are needed to grow each tomato. Human beings, on the other hand, require on average between 50 and 100 litres of water to meet their most basic daily needs, according to the World Health Organisation.